Each box contains 10 packs. Each pack contains 29 cards. 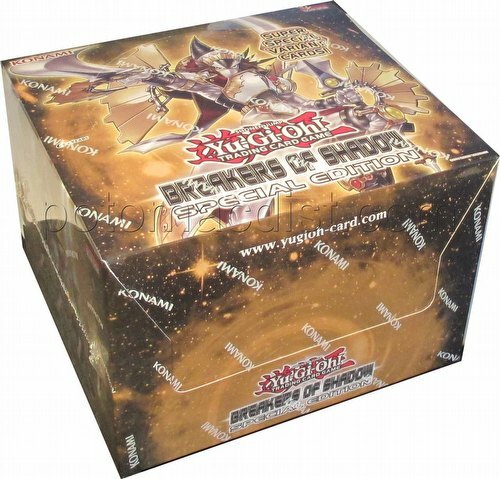 Each Yu-Gi-Oh Breakers of Shadow Special Edition box contains 10 packs. Each pack contains 3 Breakers of Shadow booster packs, 1 of 2 foil version preview cards from the Spring 2016 booster, and 1 of 2 Super Rare variant cards. Breakers of Shadow includes brand-new support cards for the legendary warrior Buster Blader, plus exciting new Deck themes like the Shiranui, Twilight Ninjas, and Dinomists. In addition, the set includes cards for other popular themes like Melodius, Goyo, Majespecter, Odd-Eyes, Performapal, and Kozmo.